There is just something about baking bread that makes me really happy!! I don’t eat a huge amount of bread but I love to bake and create a fresh loaf. If you are Irish, then soda bread or brown bread runs in your veins! We all have a family member that in our opinion makes THE best bread. Soda or brown bread is traditionally made with buttermilk. 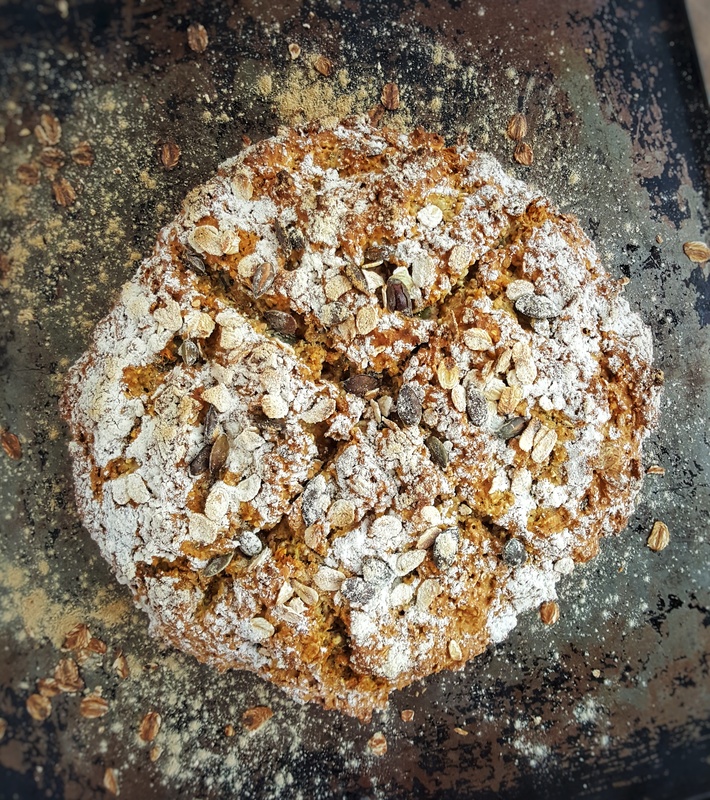 I wanted to find out what if you didn’t have buttermilk at home in the fridge, could you still make a loaf of soda bread to taste as good? What about people who are dairy or lactose-free, could they still enjoy soda bread? The answer is yes!! Buttermilk is replaced in this recipe with regular milk plus a tablespoon of apple cider vinegar. If you are dairy or lactose free use oat milk. I haven’t tried the recipe with soy or a nut-based milk yet but I would be quietly confident that it would work perfectly too (make sure to let me know if you try!). If you want to keep your loaf traditional use buttermilk and exclude the apple cider vinegar. I highly recommend you enjoy your soda bread with some raspberry jam too! If you want to freeze your loaf, allow to cool, place in a resealable bag or wrap in parchment and freeze for up to 3 months. Preheat oven to 220°C/200°C fan/475°F fan. Mix all the dry ingredients together in a large mixing bowl and create a well in the centre. Whisk the wet ingredients together and pour into the well. Use your hands to mix the dough together until it forms a ball. Place onto a lightly floured baking tray and flatten down a little with your hands. Create a cross shape on top of the bread with a sharp knife. Bake in the oven for 30 minutes. Remove and allow to cool on a wire rack.